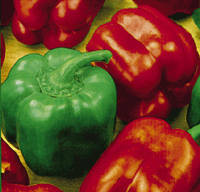 Thick-walled red and green sweet peppers. Biggest crops are produced in the greenhouse but also grows well outdoors.Open pollinated variety, producing blocky, square-shaped fruits. Mature from green to yellow.High yielding over a long period. Sow Winter, or for maincrop Spring.Sow seeds 5mm deep in pots or trays of moist seed compost, chillies like good drainage. When the majority of the seeds in the pot have emerged and are showing two well formed leaves, and before they become leggy, you should transfer them into 3 inch pots. growing / keeping them in a greenhouse, conservatory or indoors on a windowsill etc. At this stage they should be moved to a site where they will get plenty of sunlight; ideally to a heated greenhouse or warm conservatory. Once all chance of frost has passed the plants can be transplanted into growing beds or patio tubs outside, harden off first.Spacing 30-60cm x 45-90cm. Grow on at 16-23°C. These plants will do best in mild conditions. Therefore I would recommend growing in a greenhouse. Harvest from Spring, or maincrop from early summer Cut rather than pull from branch.